Thinking about buying a gas station or convenience store? In the last year alone, three new gas stations have popped up in my part of town. This would seem like a good business to get into considering there are estimated to be over 263 million cars on the road in the United States and almost every single one of them needs to buy gas. Every once in a while, I’ll go on BizBuySell and see what is available and there are always gas stations listed for sale. Currently in my state alone there are 109 gas stations or convenience stores listed and over 1500+ (which is the maximum number of results shown) across the country. Prices locally range from as low as $10,000 to over $3.5 million. Naturally, this brings up the question of whether it’d be a good idea to get into the gas station business. Before you plunk down your life savings to become a gas station owner, here are some things you should consider first. According to the National Association of Convenience Stores (NACS), less than 1% of fuel stations are owned by the major oil companies. Of the 122,552 convenience stores in 2017 selling gas, 59% are single-store operators. This means more than half of the gas stations are owned by an individual or a family. Compare this to 1994, when there were 202,800 gas stations across the country. There are several reasons for the decline in number of gas stations and why the major oil companies are getting out of the gas station business. Cars are becoming more fuel-efficient and with electric cars such as Tesla and Leaf’s becoming more popular, more and more cars in the future will not need to stop in for gas. Newly built gas stations now have many more pumps, allowing more cars to fuel up at once without waiting in line. Supermarkets and big-box stores such as Kroger, Sam’s Club, and Costco are selling gas at extremely low margins to entice customers to stop inside for other items. 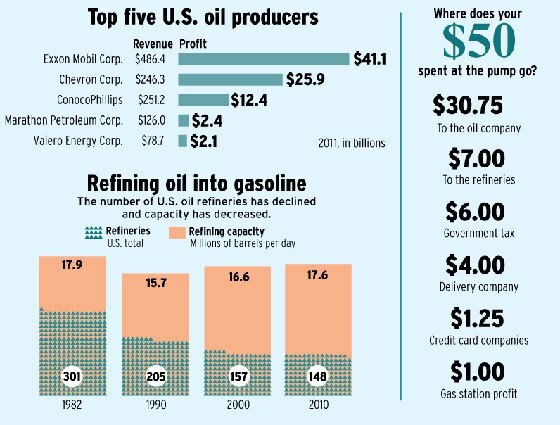 If the gas station business was extremely profitable, the major oil companies would have continued to own their stations. Being vertically integrated allows them to control their costs and earn more profits. Instead, the oil companies have sold off most of their stations. 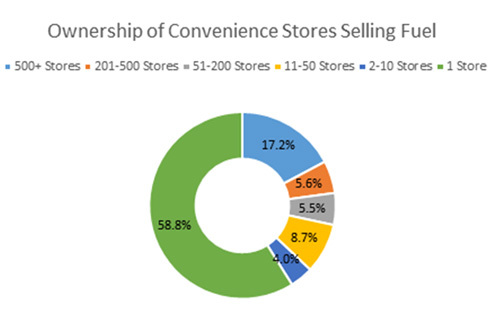 The large number of single-store owners means many of these are owner-operated stores. They are making enough to pay themselves a salary along with maybe another employee or two. If someone was doing really well in the business, the natural inclination would be to take their experience and buy more gas stations to boost their revenues and lower their costs by increasing their purchasing and negotiating powers with their suppliers. Gas station owners will tell you that the fuel sales are mainly a way to get people to stop inside the stores for a few additional items on their way home. Maybe they’ll pick up some cigarettes, a six-pack of beer or soft drinks, coffee, lottery tickets, or some snacks while they are there. The problem with this is as people get used to paying with a debit or credit card at the pump, there is less foot traffic through the door. According to the infographic on the right from the OC Register, of the $50 spent at the pump, $30.75 goes to the oil company, $7 goes to the refineries, $6 goes to the government as taxes, $4 goes to the tanker delivery company, and $1.25 goes to the credit card company. That leaves the gas station with $1 in profit. That is a measly 2% profit margin! The general consensus is for each gallon of gas sold, most stations average 3 to 5 cents in profit. Looking at some of the ads from BizBuySell, a gas station that does 50,000 gallons in monthly sales could make as little as $1,500 a month from fuel sales. This is why almost all stations require you to prepay before pumping because a single drive-off negates an entire day’s of fuel profits. As a consolation, thanks to the CARD Act of 2009, merchants can now post different prices for cash or debit/credit purchases. This is why many stations now list a price a few cents lower per gallon if you choose to pay with cash. The three gas stations at the corner down the street from my house all have the clerks behind one inch thick bulletproof glass. I regularly go for runs in the area in the evening, and don’t feel like it’s a dangerous area. This tells you that the convenience store clerks aren’t taking any chances. According to the Houston Chronicle, of the 301,235 robberies in 2013, 22,221 took place at convenience stores or gas stations. The US Bureau of Labor Statistics found that of the 4,585 workplace deaths that year, 263 were in retail and 48 of those were at convenience stores or gas stations. A gas station that is open late into the night or even 24 hours is the perfect opportunity for crime. You have a store clerk who is often working in the store alone by himself or herself. The stores sell alcohol and cigarettes, which are often the target of shoplifters. Gas stations have cash available and are often located near highways, making it easier for criminals to get away. The cheaper gas stations are also often located in the less desirable part of town. Before buying a convenience store, do an online search on the address to see if there have been any problems at that location in the past. Remember a couple years back when everyone switched from the magnetic strip debit and credit cards to chip technology to prevent fraud? Visa and Mastercard has extended the deadline for gas stations to become compliant to 2020. Experts have estimated that it would cost gas stations as much as $30,000 to upgrade their equipment to be compliant. Each gas pump will need to be re-wired to support Ethernet connections, along with being tested and verified. Older pumps may need to be replaced entirely. There are estimated to be 800,000 individual pumps that need upgrading and the entire process to install the chip readers can take up to 16 weeks. That is a lot of months for customers to be unable to pay by plastic at the gas pumps. Failure to upgrade means gas station owners will be liable for chargebacks while attracting card skimmers. Be sure to budget for the switch to chip cards if the station you are interested in is still using the older technology. Recall how the major oil companies have sold off most the gas stations they used to own? Yet when you drive down the street, you still see stations with signs for companies such as Shell, Exxon, Chevron, BP, or Phillips 66. Thanks to Top Tier Gas standards, the smart buyer knows there is not much difference in gas quality from one oil company to the next as long as it’s Top Tier certified. But because a gas station is paying franchising royalties to the oil company whose name is on their sign, they are limited to only being able to buy gas from that one company. This means you are stuck with paying whatever price the company is selling their gas for, and you are unable to shop around for the best pricing. This makes it hard to compete with the likes of QuikTrip and Racetrac, who are able to buy gas from whoever has the lowest price. So not only do you have to pay franchising fees to the oil companies from your already low fuel profit margins, you still have to compete on price with whatever other gas stations are at the corner of the intersection. Otherwise, drivers will see your competitor across the street with a lower price and go there instead. Buried at every gas station are giant underground storage tanks to hold the gasoline. If these tanks leak, they will contaminate the soil and groundwater. According to the EPA, the average gasoline cleanup cost is $130,000. If only a small amount of soil needs to be removed, the costs can be as low as $10,000. If ground water is affected, it can cost over a $1 million. The typical station has three tanks, and the cost of replacing the underground tanks can be as much as $150,000. While the tanks are being replaced, the station won’t be able to sell any gas. For this reason, many small operators have been unable to afford to replace these underground tanks and are forced to close or sell their station. Before buying a gas station, it is a good idea to do an inspection of the storage tanks and get an idea of their condition. Almost all states have adopted a double-lined tank requirement. If you find a station still using the older single-walled steel tanks, you might be on the hook to replace those tanks in the future. In addition to all the things already mentioned, other things you will need to look out for include the possibility of another gas station opening across the street and highway construction. Your station may be the only station there for years, but you’ll see a drop in traffic the instant a newer station pops up next door or further up the street. You are also at the mercy of the city or state blocking off your street or freeway exit for road construction and making your business inaccessible for months or longer. Check with the city hall and local building departments whether there is any road work schedule. Now that you’ve read about what to look out for, here are some things you should look for when evaluating a gas station business. Location: Immediate access right off the interstate or a high traffic road with minimal competition is the best. When getting off the interstate, people tend to like to make right hand turns. Rural locations might be listed for cheaper, but unless you also live in the middle of nowhere, you don’t want to be driving hours to get to your business unless you intend to be an absentee owner. Attractiveness: A large lot with plenty of parking, many gas pumps, bright lights, and canopies over the pumps will help draw in motorists. Sales History: Don’t just trust what the owner lists on their books. Check the company’s tax returns going back at least 3 years. All you need is to get an authorization from the business owner to access the tax records from the IRS. Unscrupulous sellers might “massage” the numbers in their books to make their business look more profitable, but many are less are likely to cheat the IRS and risk getting audited. Large Convenience Store: According to the NACS, gasoline accounts for 70% of a station’s revenues, but only 30% of its profits. The more products such as alcohol, Slim Jims, Doritos, and Snickers you can sell, the higher your profits. If you are able to add in a restaurant or deli that offers fresh food, the greater the selection you can offer your customers and the higher the margins. No matter what type of business you are buying, you need to do your due diligence. 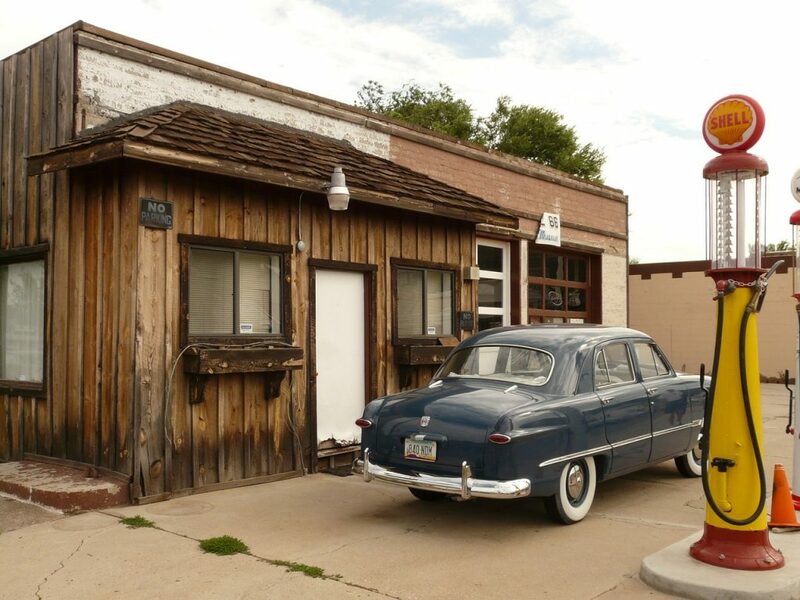 Owning a gas station could provide you with a stable business income for years. High volume stations have net some owners over $400,000 a year in profits. Like many brick-and-mortar businesses, a convenience store has many moving parts. Do your research and take advantage of the internet to read about the experiences of other gas station owners before jumping in. Have you thought about owning a gas station? Do you think convenience stores are a good business to get into? I like that you said that it’s best to choose a gas station that’s located in a high traffic road to make sure that customers can easily access it. My husband and I are dreaming of owning a gas station in the future that will offer air machine services to our target customers. We’d like our business to sell so we can get a lot of profit out of it. Thanks for sharing this.